Fort Collins, Colorado is a community that has been named among the best places to live in the United States. Its awards have included #4 healthiest city in the U.S. and the second best place for job seekers in Colorado. Though our community prospers with the university atmosphere, the thriving microbrewery culture, and physically active residents, there has still been a 36.5% increase in homelessness since 2000. 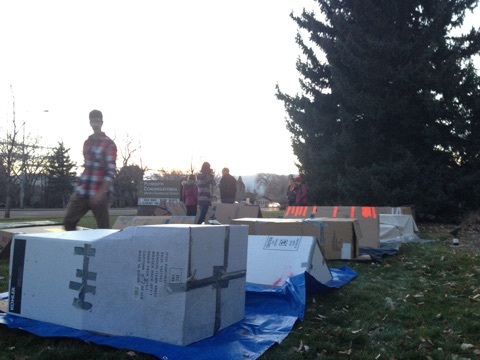 Last night I slept outside in Fort Collins as part of an annual initiative to raise awareness for homelessness in Larimer County, and to empower youth to take action. I learned so much about the homelessness in my back yard, and about different organizations that are working to end homelessness and to support those living in poverty throughout the region. As a chaperone for the event, I watched leaders in homeless prevention host a series of educational activities to help the high school students learn about homelessness in Larimer County. From talking about statistics in the community, to engaging with a calculator created by New York Times about cutting deficit and the challenging issues that face our politicians today, we spent hours learning about and empathizing with our neighbors in need. Following these engaging activities we watched a documentary film called Storied Streets, which follows several people living without a home throughout the U.S. and discusses the circumstances that led them to living without a home. Each of the individuals in the film had experienced circumstances that could happen to any of us, like unexpected medial bills and paying for education. According to the film, the main causes of homelessness include; 1. Lack of affordable housing, 2. Lack of a livable wage, 3. Medical issues/conditions, 4. Domestic violence, 5. Mental illness. (For more statistics and facts like this click here). The film discusses stereotypes about the homeless in the U.S., and the dehumanization that has led to violent abuse. One example of the abuse was a series of Youtube videos called “Bum Fights,” where the film makers would pay homeless individuals to commit dangerous acts including lighting themselves on fire, and fighting. This was considered entertaining because many in our society don’t see the homeless as humans–they are considered the “other.” Homeless are commonly stereotyped as having something (a disease or illness, for example) that those who have a home don’t, or missing something that those who have homes have, which in tern makes them unworthy to fit into our society. “Bum Fights” showed the film makers urinating on, throwing glass bottles at, and abusing the homeless in other senseless acts. Following the screening of Storied Streets, our group headed outside to the box tents we had put together earlier that afternoon. We stayed by the fires for a few hours until about 2:00a.m. then headed to bed. 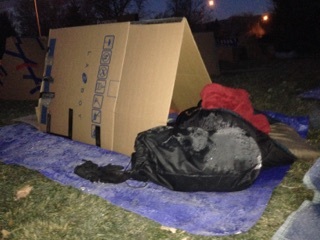 Sleeping outside helped bring to light quite a few things that might seem small, but are details about living without a home I might not have realized otherwise. When we went to sleep, I had to take off my boots, two of my jackets, my scarf, and hat, just to get in my box. I left my jackets and belongings outside of my box because there wasn’t room inside. 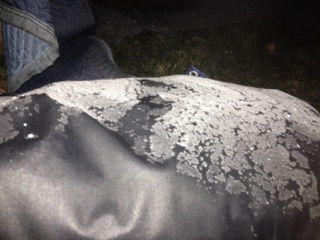 When I woke up this morning after 4 hours of sleep, my jackets and boots had filled with dew and were frozen stiff. Unlike those who experience homelessness on a daily basis, I had a building to walk into, but many who live without a home day in and day out have to wait for the sun to come up to defrost their clothing. Covering my face from the cold, tossing and turning from having my legs folded into my chest in my small box, and the dew soaking into my box, I started to feel what hundreds of people experience every night. 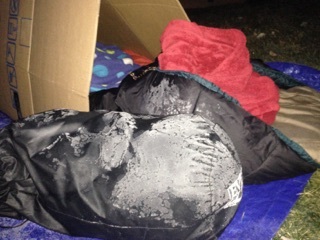 Frost collecting on my box and my belongings at 6:00 a.m. I noticed I was hungry when I woke up, not having had eaten since 7:00p.m. the night before. If I were homeless, I know that I wouldn’t control when, where, or what I eat. The lack of sleep and slight hunger made me think to myself… If I were homeless, could I interview for a job today? Could I find childcare for my kids today? Could I do this again tonight? My night sleeping outside was an engaging and eye opening experience. Talking with the high school students who, full of energy and enthusiasm, discussed engaging with the national, state, and local government to create change in our community and nation. We discussed ways that we can help individuals who are experiencing homelessness today. 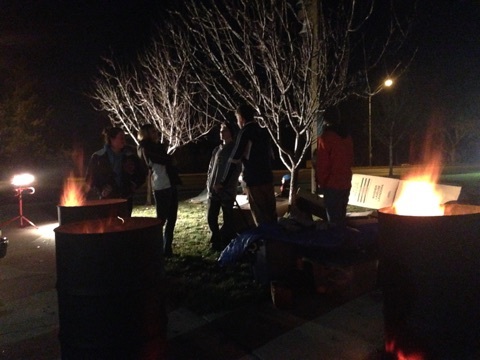 We discussed humanizing homelessness and bringing this issue to light. Storied Streets mentioned that there are four times as many animal shelters in the U.S. as there are homeless shelters, and this November 2014 one of the high profile issues in Larimer county was funding for a new animal shelter (those of you who know me, also know I am not speaking against animal shelters). I do think it is interesting to note that we have so much compassion for animals, but not the same level of compassion to our neighbors who have been sleeping on the street because they are unable to find affordable housing. Gathering around fires for warmth. I think his story represents the work we have yet to do to treat our neighbors with respect, honor, and dignity, and to help those who are facing a time of difficulty. 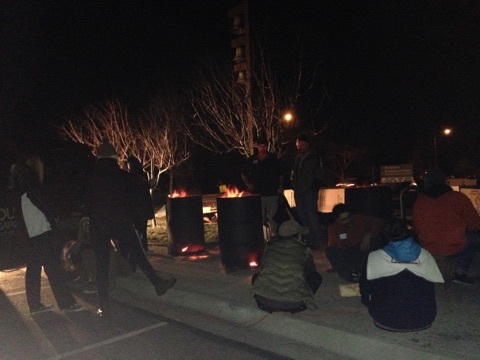 To donate to an organization that is working to end homelessness in Larimer county and who helped put on this event, visit Homeless Prevention Initiative online (Click here to donate) or Homeless Gear online (Click here to donate).